Here we are, another month has passed us by so quickly and I suddenly find myself the mother of a five month old. Baby K is getting so big and is quite fun right now. It’s awesome to see her change and to watch her level of interaction increase with each day. I have a very curious girl who loves to check out her surroundings and look at everything. Stats: 14.6 pounds. We don’t go back to the pediatrician until Baby K is six months old, so we had to weigh her at home. Development: Baby K is pretty close to being able to sit up all by herself. 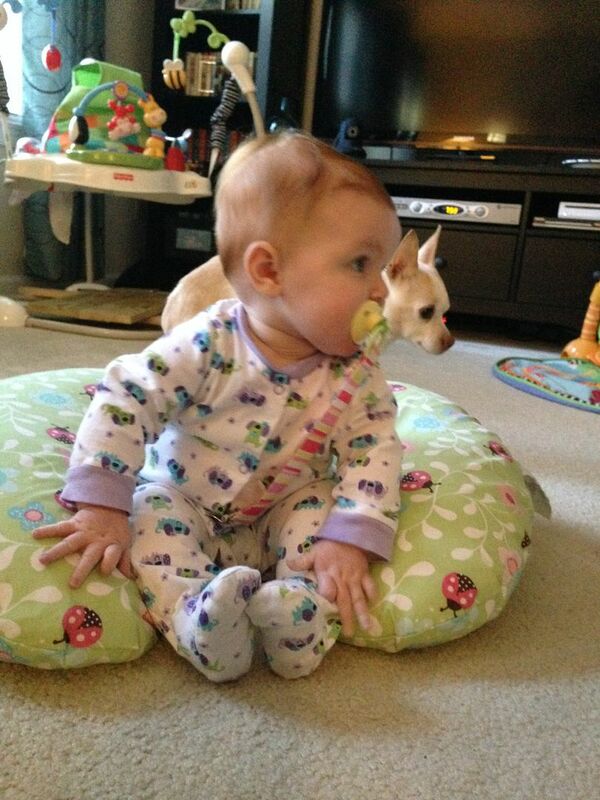 Right now, I use the Boppy pillow as support behind her but it is just a matter of time before we no longer need it. She is also getting the hang of how to jump and march in her jumperoo. And when she’s relaxing in her bouncy seat, she often tries to pull her body up. I hope she doesn’t tumble out!!! We also tested out real people food and gave her pureed green beans. She made such funny (read: awful) faces, but she did keep eating the green beans each time we offered them to her. Loves: She loves to talk! Every morning on our way to Miss Gina’s (where Baby K stays during the day), she carries on a conversation with the bugs hanging from her carseat. It is adorable to listen to and such a sweet sound to hear. The only thing she loves more than talking is sucking on her hands, which she sometimes does while talking. It’s hilarious to hear the muffled sounds escape from her mouth! We also discovered (in an attempt to get her to laugh when she was upset) that she likes being thrown up in the air. I love to see her giggle and smile each time we toss her about. Don’t worry, she barely gets out of our hands – it’s not real tossing. Dislikes: This hasn’t changed from last month; our girl is just like her parents with the fact that she hates being tired. She really only cries if she is sleepy, but her crying goes from 0 to 100 in 2.5 seconds flat! And just like all babies, when she is hungry she does not like to wait!!! 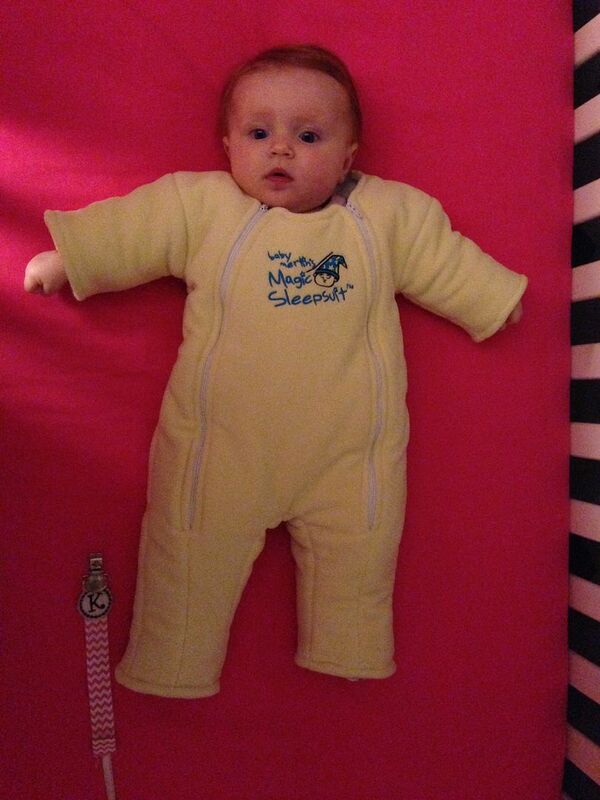 Sleeping: We stopped swaddling Baby K at night and switched to using Baby Merlin’s Magic Sleep Suit. She is rolling over more and has often looked like she is going to roll over while swaddled which scared me – I certainly didn’t want her rolling over in her sleep and getting stuck there. And just like it was meant for me to find it, I saw my buds Ruthie and Chandelle talking on twitter about the suit. So I decided to buy one and we love it. I was concerned that Baby K would have some sleep regression and not give us the 11 hours a night that she previously did while swaddled, but that wasn’t the case. She sleeps like a champ in the suit and I don’t have to worry about her getting cold at night as the suit is very thick and warm. She looks like an astronaut in the suit – it’s quite funny. Diapers: Still in size 1 Pampers, but we are close to switching to size 2. And lucky for us (and not so much for Miss Gina), we don’t have to change that many dirty diapers, only wet ones. Sorry, hope that wasn’t TMI. Eating: Our girl is definitely growing and needs more at each feeding than she previously did. I hope I can keep up! We still follow the Baby Sleep Solution, so she eats four times a day, ever four hours. She still exclusively gets breast milk, I hope I can continue to produce enough to last her this entire first year of life. And like I said above, we started adding some real food to her diet. Maybe this week we will give her some rice cereal. 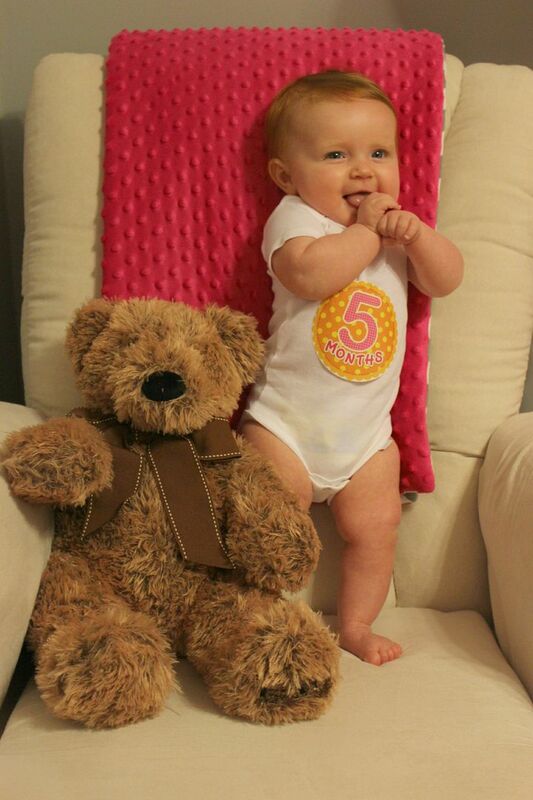 Clothing: She is definitely growing and primarily wears 3-6 month sized clothing. It is so crazy how the same size even within the same store can vary. Since the weather has gotten colder, I realized that Baby K needed more long sleeve shirts and pants. So I bought several things from Old Navy in size 3-6 months. The onesies that I bought are great, bordering on being a little big, however the pants I bought in the same size are very snug. They get tight on her tummy, especially after eating. I will probably be back at Old Navy in the next week or so buying pants in a larger size. Miscellaneous: I finally feel like we are in a good place with this whole parenting thing. I don’t feel as overwhelmed or stressed out anymore. When Baby K was first born, I was constantly stressed out in every situation because I had no clue how she would react to things and was always so nervous that she would cry at any second. But now we are in a great routine, we know her cues and she knows that she can trust us. It’s so awesome to pick her up when she starts crying and have her immediately settle down. I love that my daughter knows she is safe with me and Tolar. 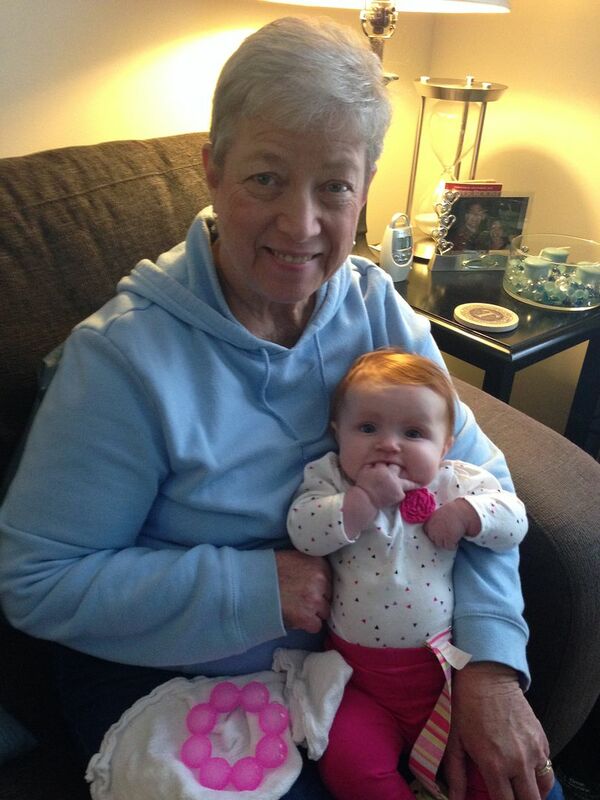 We are also having a blast interacting with her and watching her smile and giggle. It seriously is the best thing ever to have your child’s entire face light up the second she sees you. Happy five months! She's is so precious. I love the picture of her in that sleep suit!! 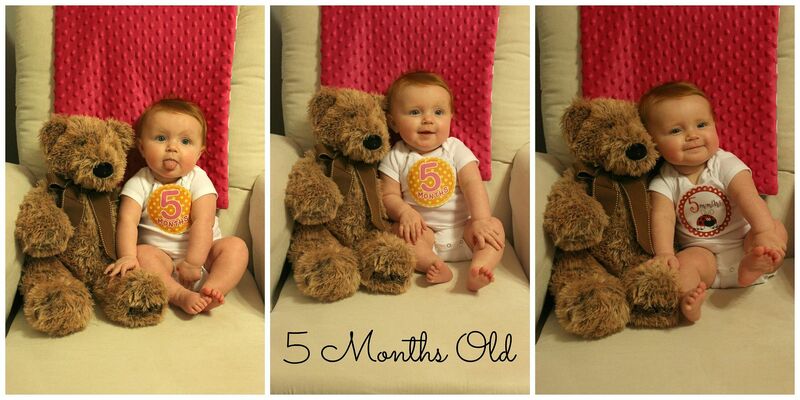 Oh my gosh, she's getting SO big!